It goes without saying, you need to clean your makeup brushes regularly. There’s nothing pretty about bacteria in your makeup and on your face. There are two easy methods – spraying with alcohol and washing with shampoo. Makeup artists have stringent brush cleaning routines, but you don’t need to be as strict with your personal brushes. 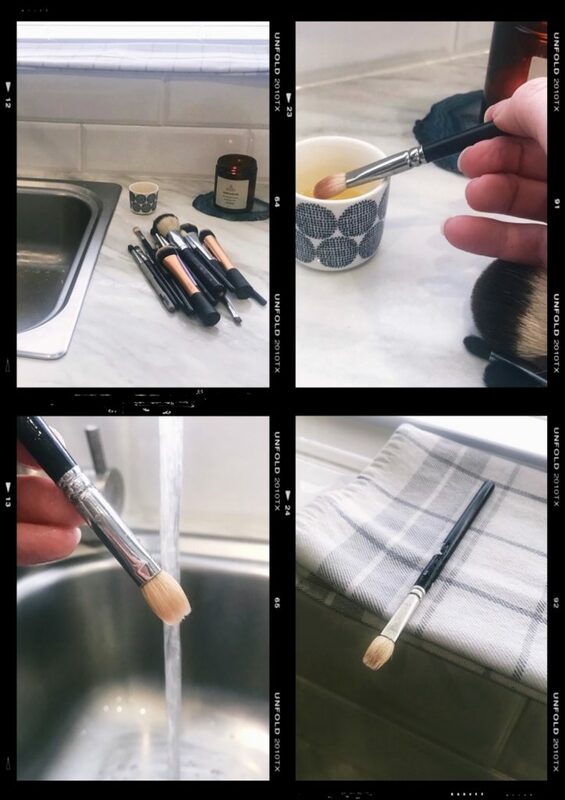 If you use your brushes every day you should be giving them a deep cleanse weekly. But I know life gets in the way, so please aim for once or twice a month and quick alcohol cleansing in between. I usually use The Pro Hygiene Collection for keeping my brushes clean but it appears to be sold out at the moment. Beauty So Clean and Cinema Secrets also respected for their hygiene products. This method is used for a quick cleanse between washes. It’s particularly useful if you want to use the same brush for different shades of makeup (for example, you want to use the same brush for a champagne eyeshadow and a dark brown eyeshadow). Makeup artists use this method to keep brushes clean between clients. You will need an alcohol spray designed for brushes and some kitchen paper (a towel you don’t mind staining would work too). You can spray the bristles directly but I prefer to spray the paper. Simply swirl the brush in the alcohol until it’s clean. It’ll take about a minute to dry thoroughly. This method gives brushes a really deep clean. There are lots of antibacterial brush shampoos and cleansing bars on the market. A mild hair shampoo, such as Dr Bronner or baby shampoo are okay to use too. I would also recommend buying a silicone brush pad (you can find them for a few pounds in Primark or bargain shops). I’ve filmed a video to accompany this blog post, you can watch it on my IGTV. Did you know I offer makeup lessons? Get in touch to find out more. Does your eyeshadow crease? Do you struggle to get a good blend? You might just need to make a few simple changes. The secret to good eye makeup? Good basics. This means a decent set of brushes, lid primers and quality matte neutral eyeshadows. Plus, a basic understanding of key makeup terms so you can follow a tutorial with confidence. Where eye makeup can be applied. A basic guide to eyeshadow placement (there are no rules but this is a good starting point). Think about the tools you currently use to do your eyeshadow. Do you have one sad, old brush that does everything? Or do you have a nice brush set but you’re not sure what to do with it? The reality is, you can’t achieve a beautiful blend without the right brushes. Small tapered brush, Medium tapered brush, Medium fluffy brush, Large fluffy brush. The absolute essential for eye makeup is a blending brush. I use a combination of sizes and styles to achieve most eye makeup looks. The fluffy brushes are good for blending shadows together and creating a soft edge. Tapered blending brushes do a similar job but in a smaller, concentrated area (very useful for smokey eyes). If you only get one blending brush, make it a medium fluffy (my favourite is a MAC 217). It’s a multitasker that can achieve a simple eye look without a lot of effort. However, if you want a great smokey eye, you really do need the lot! Flat shader brushes are the best tools for applying the main lid colour. They allow for precise placement, in addition to retaining the intensity of the eyeshadow pigment or glitter. Definer brushes (or smudge brushes) are used for applying eyeshadow close to the lash line or smudging eyeliners. Much better than the flimsy brush that comes with liquid liners. They can be used for gel, liquid or powder (or even to wing out kohl pencil). My favourite is the angled brush but I think this comes down to personal preference. The underdog. Spoolies are a handy tool that can be used for eyebrows, lashes and knocking off annoying specks of dried mascara and glitter. I’m a strong supporter of the eyeshadow primer. They offer longevity, help eyeshadows ‘pop’, and the opaque versions can cancel out redness, veins, stray eyebrow hairs and pigmentation. Marvellous! Not all primers are created equal. I use NARS Smudge Proof Eyeshadow Base on everyone. It’s that good! If I need to create a blank canvas I like to follow up with a Paint Pot by MAC. I usually choose a slightly lighter shade than my client’s skin tone to make eyeshadow stand out. Urban Decay primers are also a good shout. I like to set them in the crease area (avoiding the eyelid) with a skin tone matte eyeshadow or a translucent powder. You can use a concealer but it’s risky. You have been warned. They are the boring, often murky looking, matte shades. They are essential for blending and creating beautiful eye makeup looks. Necessary for both simple and complex styles. Transition shades go from ivory, right through to medium brown/grey. They are cool or warm toned. At the very least you need a mid-tone neutral to place in your crease. The transition theory can also be applied to colourful looks (light, medium and dark matte purples, for example). For darker, smokey looks, you would also need dark browns, greys or even a black (sometimes referred to as smoke shades). A decent eyeshadow palette will have a range of matte shades included. Whilst you might like to use matte shades exclusively, shimmer and glitter formulas can add extra dimension and make your eyes a focal point. They are usually applied on the eyelid and blended with transition shades. Light shimmery shades are great for highlighting the inner corner and brow bone to achieve a brighter, lifted eye. And don’t let anyone tell you you can’t wear glitter over a certain age. Rubbish! I’ve applied silver glitter to a lady in her 70s (on her request) and she looked fabulous. Use finely milled formulas, apply sparingly and you’ll be just fine. Do your eye makeup before foundation and concealer. This means you can apply your eye makeup without worrying about making a mess. You can then wipe away the fallout under your eyes with a cotton pad and micellar water before doing the rest of your makeup. Hello clean, bright under eye concealer. Just don’t forget to use a clean fluffy brush around your eyeshadow to make it seamless. I’ve demonstrated a lot of this information for my Instagram TV video. Head to my eye makeup blending tutorial to see these tips and products in action. Would you like a personalised makeup lesson? I offer 1-2-1 and small group lessons tailored to your requirements. Get in touch to find out more. Skin is a fickle thing. Environment, health (physical and mental), diet, hormones and trying new products can all play a part in disrupting the balance. Stress is a huge factor! Even when skin is behaving, your makeup may require some TLC. You see, makeup doesn’t appreciate tears of joy or dancing wildly to Love Shack. So, what can you do if you start seeing signs of wear on your wedding day? Here are my suggestions for makeup dilemmas and the products you can rely on. Blotting Sheets – NYX sheets are cheap and do the job. Cotton Buds – In case you need to do a clean up job around your lips or eyes. Pressed Powder – I like Charlotte Tilbury but anything you already have will be fine. Powder Brush – Obviously to apply powder, but also to buff and refresh later in the day. Setting Spray – This is your magic potion. Often comes in a travel size version. I like MAC Fix+ and Urban Decay All Nighter. Concealer – This must be easy to blend with fingers. Lipstick/gloss – Because it will definitely come off with all the kissing and toasting. Eyeliner Pencil – Only necessary if you’ve opted for liner in your water-line. Some brides decide to add it in the evening to vamp things up. Blusher – Colour can fade throughout the day so it’s lovely to have a similar shade to freshen up. Highlighter – For glow addicts who refuse to be outshone by the disco ball (I am one of those people). A second lipstick – Again, some brides go with a bolder shade for evening. A multi-use balm – Think 8 Hour Cream or Paw Paw. For dry lips and flaky skin. HAVE YOU HAD A TRIAL? A trial run helps to ensure you’re wearing the best combination of products for you. Every so often I have a client who loves their look, but they need to come back to try a different foundation because it hasn’t performed quite as well as expected (this goes back to my point about skin being unpredictable). I offer this service for free because I want the absolute best for my brides, but I would advise checking individual policies on this. An experienced, reputable makeup artist will be able to deliver a gorgeous bridal look, that has a good chance at longevity, without a trial. Do your research. HOWEVER, there is a chance that the products just won’t get on with your skin (through no fault of the makeup artist). Decide if this is a risk you are willing to take. Tears cutting through fresh powder. Oh my! Once your natural oils have kicked in later in the day, this shouldn’t be a problem. Just dab with a soft tissue and add a touch of concealer/powder if required. If the powder is still fresh (and your makeup artist has left) mist with setting spray and gently pat with fingers. Dampening the powder will allow you to reapply a small amount of concealer without creating a cakey mess. Follow with powder (and blush if needed). If you’re prone to getting emotional (or you have oily eyelids, for that matter), seriously consider having a lash treatment prior to the day to eradicate the (slim) chance of panda eye or flapping false lashes. Unless you’re baked to the hilt (which doesn’t look marvellous, in my opinion) undereye creasing may occur. Simply pat with your ring finger to blend. If you feel like you need to the brighten the area, now would be a good time to top up your concealer. Finish with a touch of pressed powder and a spritz of setting spray. Brides with oily skin and dancing queens, I feel you! Blotting sheets are excellent because they soak up oil and moisture without leaving any residue. This avoids a powdery build up from too much pressed powder. If you feel like a major touch up is due – blot first, spritz with setting spray, buff or pat gently with a powder brush (avoiding your eyes), apply pressed powder and spritz again. This can affect dry and dehydrated skin types. Choose a hydrating setting spray (MAC Fix+ for example) and give your face a decent spritz. Pat any patchy areas gently and allow to dry. This should redistribute the makeup and give your skin a glow. I’m referring to the classic ‘I’ve been blowing my nose for a week’ look. If you have a cold or it’s been streaming alongside your happy tears, you’re likely to rub off the makeup with tissues. If it’s dry or sore you can mix a tiny amount of multi-purpose balm with your concealer, then pat gently to the affected area. Finish with a touch of powder. If you have spots along your jawline, they may become visible throughout the day. This is because concealer has a habit of rubbing off on your guest’s shoulders with every hug. If your top layer of powder has settled and blended with your natural oils, you can go ahead and re-apply concealer and powder. If not, dampen the area first with a light mist of setting spray. 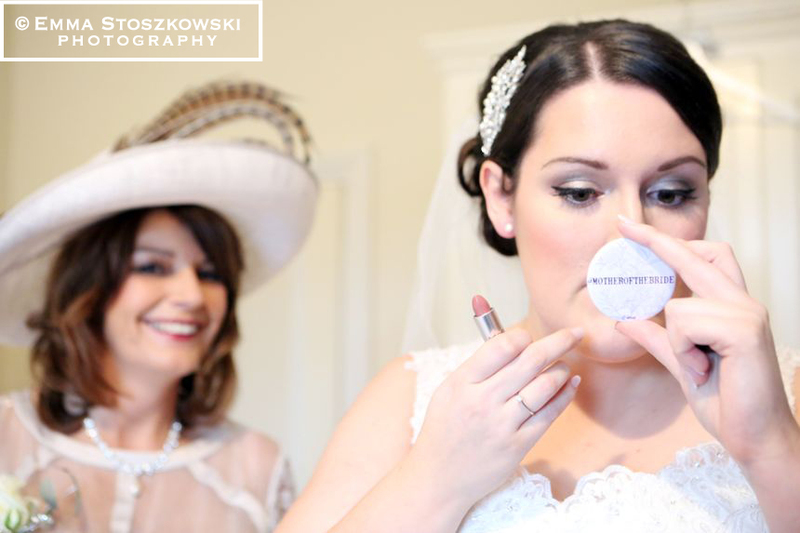 There you have it, my top tips for brides who would like to do makeup maintenance throughout the day. Of course, I’m not suggesting that you MUST keep a close eye on your face (lots of brides tell me they let loose after the photographs), but if it’s an important factor for you I hope this advice is useful. Have you booked you makeup artist yet? Why not take a look at my portfolio to see if you’d like my style of makeup on your special day? If you like medium/full coverage at all times, don’t buy a tinted moisturiser. They’re not typically buildable and you will be wasting your money. Instead look for a foundation with a lighter, buildable formula for the summer months like the RMK Liquid Foundation. If you like sheer/medium coverage, a tinted moisturiser is perfect. In my experience, drugstore versions do little more than than add a sheer veil of colour. If you’re looking for something that’s going to provide a fresh, even coverage, high end is where it’s at. 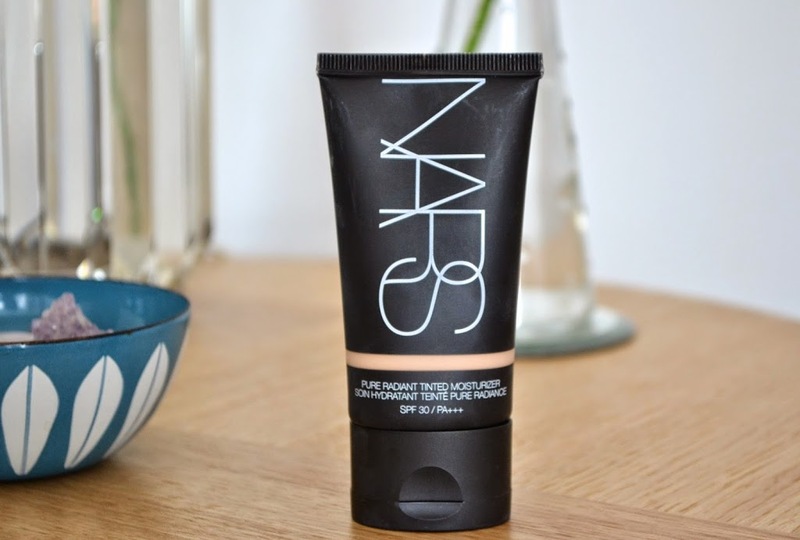 Laura Mercier, Jouer and NARS are all regarded highly for their tinted moisturisers. My personal favourite is the Liz Earle Sheer Skin Tint, but the NARS Pure Radiant Tinted Moisturizer is also very impressive. For acne-prone skin, La Roche-Posay have brought out a tinted version of Effaclar Duo. You don’t need to look for oil-free formulas, although these can also work for you with a little extra TLC. Begin with a spritz of hydrating toner and follow with your regular moisturiser. After five – ten minutes, apply a pea-sized amount of tinted moisturiser with your fingers or a damp sponge. If you need to powder, use a small brush, such as the Real Techniques Setting Brush, and gently tap a translucent powder between your eyebrows, around your nose and over your chin. If you feel like you need a little more hydration, use Fix+ or another spritz of hydrating toner. As a general rule, the oil-free formulas work well with your skin type. You don’t have to abide by this, as long as you’re prepared to do a little t-zone maintenance throughout the day. Begin with a spritz of hydrating toner and dab your regular moisturiser on any dry/flaky patches (for example, I would apply it over any healing blemishes). If you need your makeup to last all day, apply a primer to your t-zone. Next, apply a pea-sized amount of tinted moisturiser with your fingers, a buffing brush or a damp sponge (avoid buffing any flaky patches of skin). At this point, you can choose to blot your t-zone with a tissue to take away excess moisture. Use a small brush to powder the t-zone. If you like, you can finish with a setting spray. Precision concealing is key to making a tinted moisturiser work. Haphazardly concealing large areas of skin is going to look strange against the ‘your skin but better’ finish. Instead, dot concealer over any blemishes (I’m talking pin point precision) with a tiny brush and blend with a finger or a small, fluffy brush. Tinted moisturisers tend to feel slightly tacky when first applied. If you’re planning on using a powder blush/bronzer, dust a light layer of translucent powder over your cheeks to ensure hassle free blending. It’s highly likely that you’re going to need to touch up throughout the day. Pop a powder compact, a few blotting sheets and a concealer in your bag.